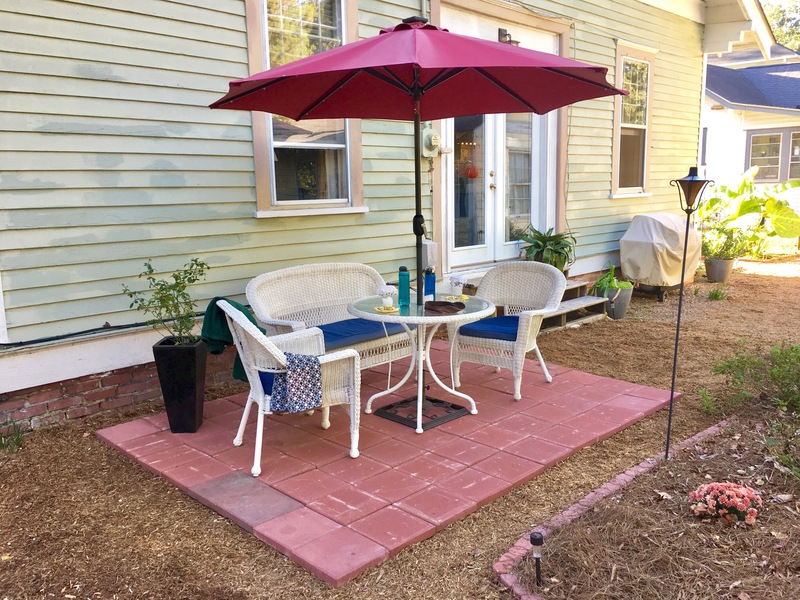 We decided to use the paver’s originally purchased to build a small patio on the backside of the potager for a small patio at the back of the house for the seating area because of the standing water problem in this area. Also the feet of the chairs would sink into mulch. It was simply done and doesn’t look too bad, but I expect, in time, the paver’s will settle oddly and have to be redone. However, I do have plans for a low deck to be placed in this area so perhaps this patio will hold out until such time. 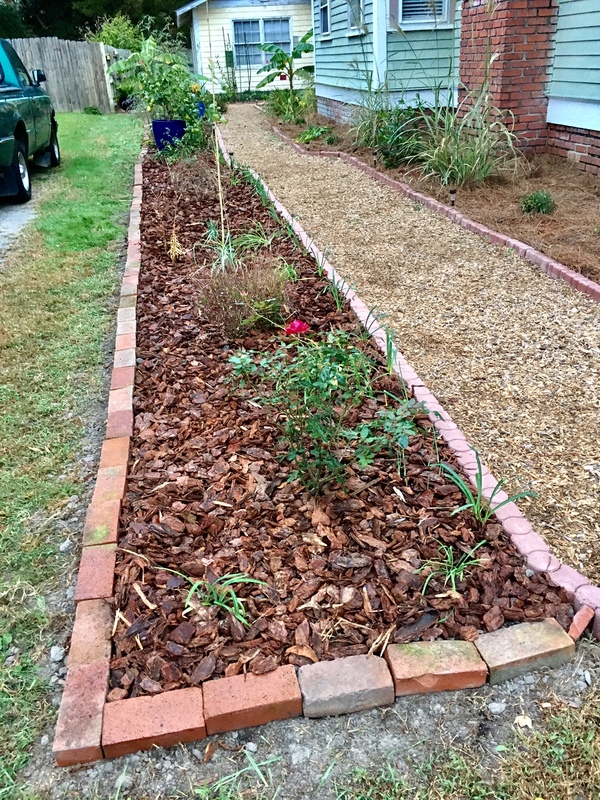 The side bed in the former Bog of Despair has been completed, as far as structure goes. It turned out to be a rather large bed! 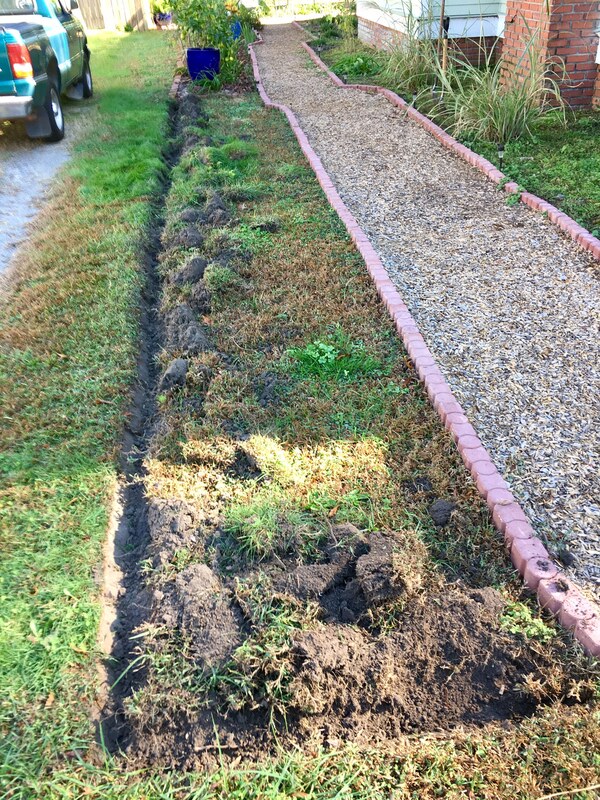 It’s basically the entire length of the house and ends at the front yard… waiting for the day it will spill into the future front garden beds. Most of the plants I put in the bed are bulbs so it looks barren compared to the original half of the bed, but I know it will catch up next season. Melissa transplanted more of the red spider lilies to the bed directly alongside the house. These lilies are being placed here because there are so many that need to be moved from behind the cottage. As the garden develops these bulbs will be moved around to various locations. We also managed to relocated one of the Musa Basjo banana trees to the bed directly against the house. The two banana trees together along with the Thai giant elephant ear was too much and the banana tree that didn’t get move already is producing three offshoots so I know it will develop quite a nice clump next season. 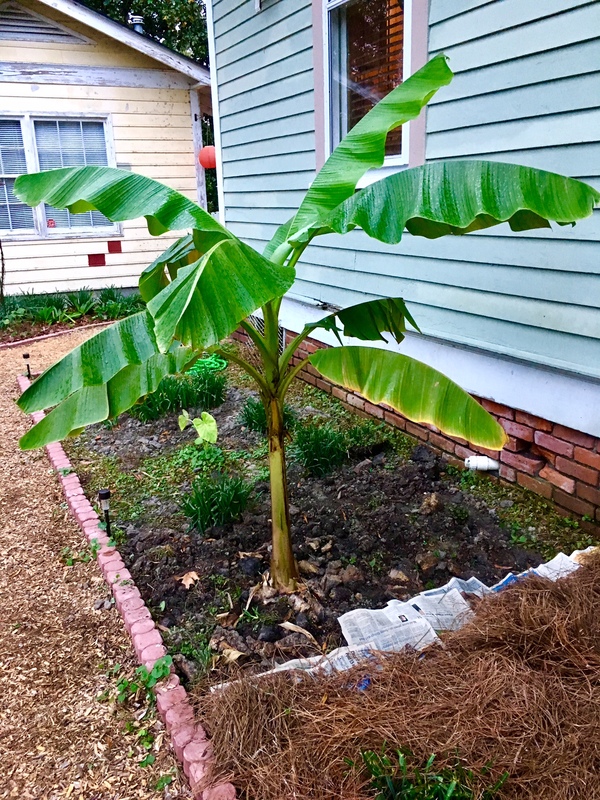 Transplanted banana tree, doing well. 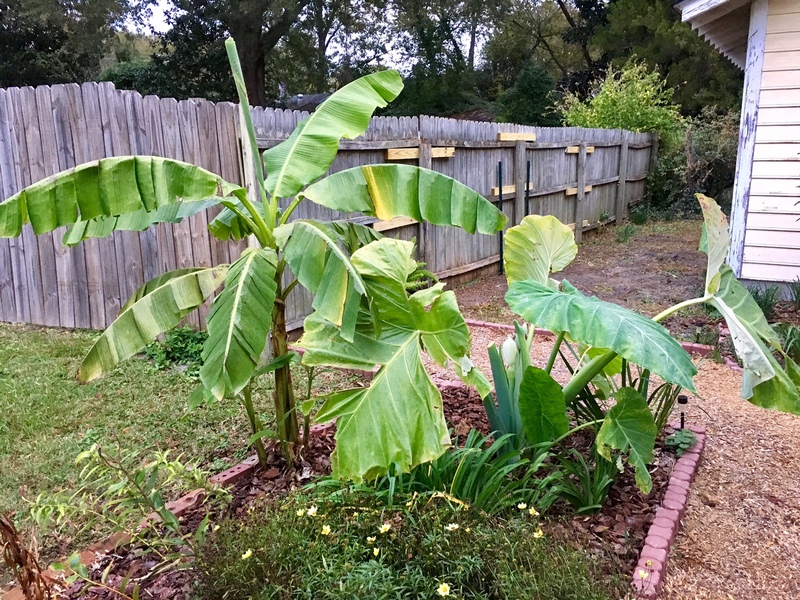 Original banana patch and Thai giant elephant ear… looking a bit bedraggled from Hurricane Matthew and now the cold nights. I have been glazing the windows of the cottage and I have 9 more panes of glass to glaze and I will be finished with this project. I can move on to the next phase of its restoration, scraping and sanding, which has already begun here and there. I have been testing what is the best way to accomplish the task at hand. 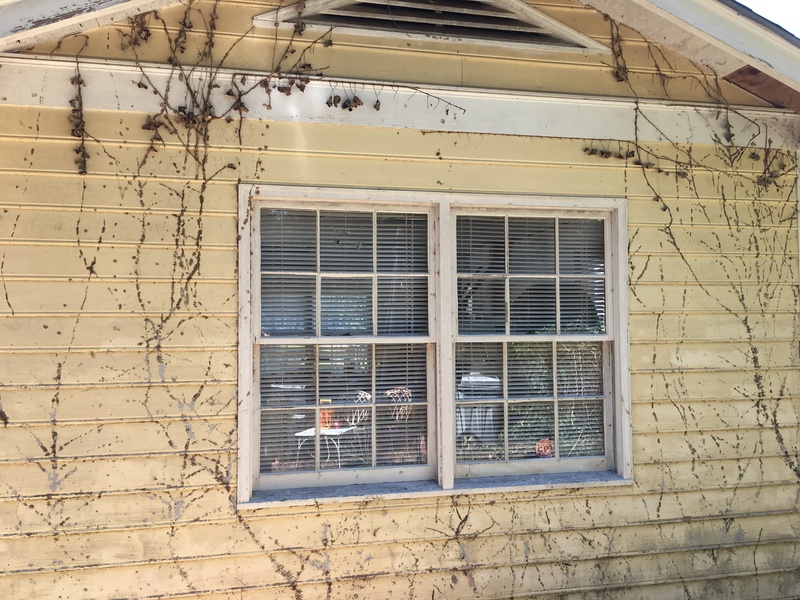 The structure had been neglected for over a decade or two and it was covered in English Ivy and other vines, which got into every crack and crevice that the vines left behind their roots stuck to the structure. This is what needs to be scraped and sanded. Just look at this wall! Mother trying her hand at sanding. 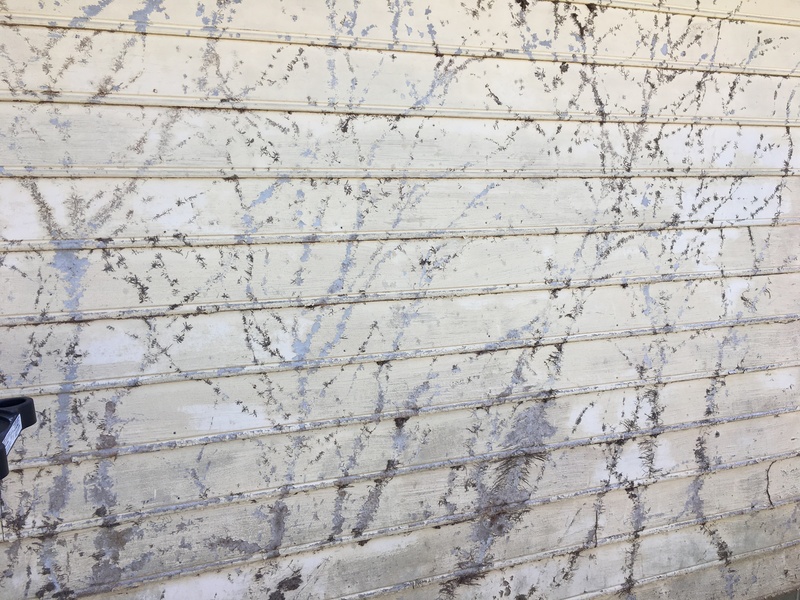 My mother decided she wanted to try sanding the cottage walls and enjoyed doing it! 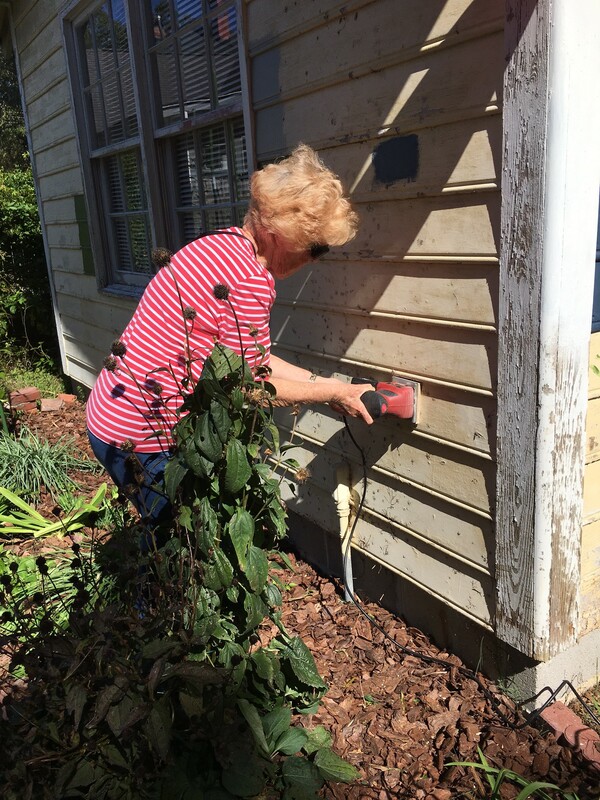 A neighbor exclaimed “elder abuse!” Though it might be said she got more done in 30 minutes than he does in a day. 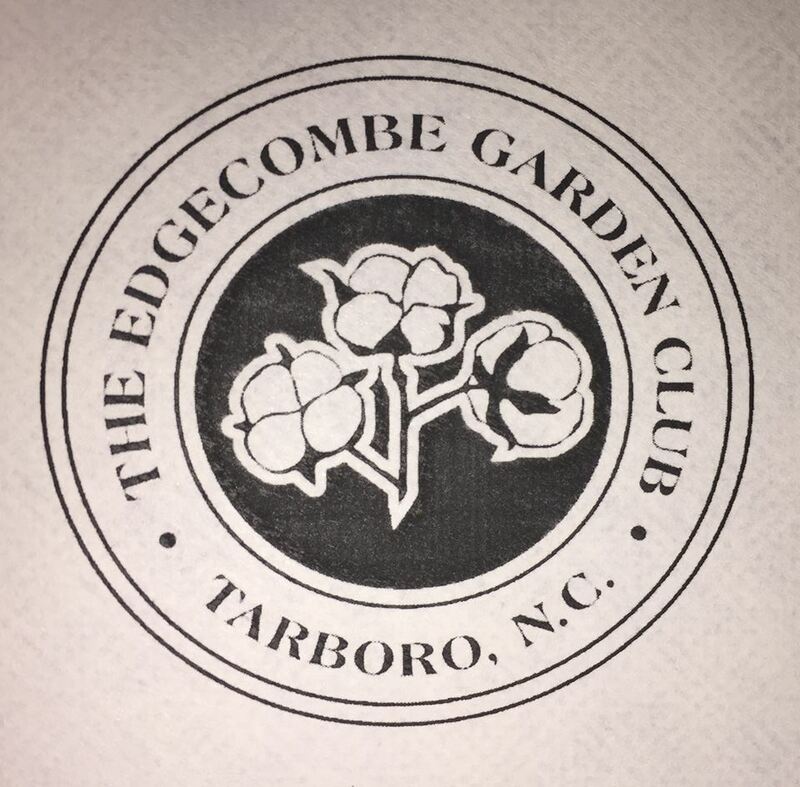 In other news, last week I committed to opening the garden to the Edgecombe Garden Club. I have been resisting because I don’t feel the garden is presentable for such an event, but I decided perhaps it would not be such a bad idea as it will push me to get projects completed. I have no details on how such an event unfolds because I have not been told much. I do know it will be a couple hundred people visiting and they are brought in on a bus and that my garden is being billed as a “Work in Progress,” which to me means it’s a mess… and the tour is on 13 May. Basically, I’ll be stressing for the next 6 months.